I know strawberries are a summertime fruit, not a wintertime fruit, but I love them so much I sometimes get cravings for them in the wintertime too. And since these Strawberry Pinch Cookies use jam or preserves–not fresh strawberries–they are the perfect way to get a little strawberry fix without tracking down a fruit that’s not in season right now. These pinch cookies look very fancy and delicate, but they are actually quite easy to make. You just mix the ingredients, roll out the dough, cut into squares, fill with jam, pinch and bake! Once they’ve finished baking, give them a light dusting of powdered sugar, and you’ve got yummy strawberry cookies with cream cheese ready to go! 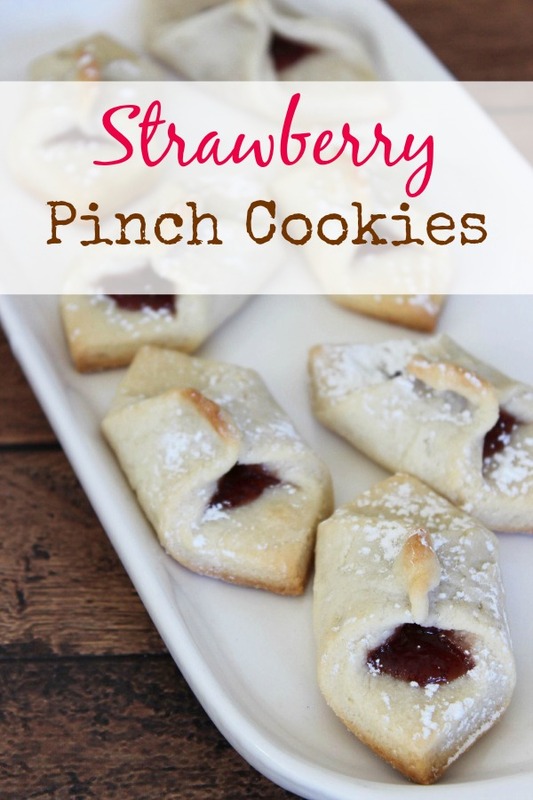 Unlike other strawberry desserts, these Strawberry Pinch cookies are quick to make, easy to transport, and easy to eat without making a huge mess. Give a toddler a slice of strawberry pie and you’ve got quite a mess to clean up! Give a toddler these strawberry cookies, however, and the worst you should have is a light dusting of powdered sugar and crumbs. Plus, if they take a tumble in your car while you are driving them to their destination, they aren’t going to take quite the beating that other strawberry desserts would. 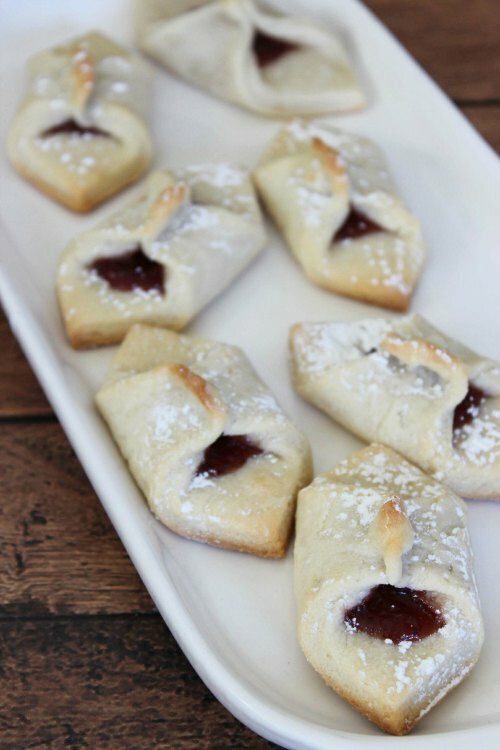 These Strawberry Pinch Cookies are a nice treat to have around the house whenever you have holiday guests coming and going. Store them in an air-tight container, and guests can grab one or two whenever they pass through. Of course, depending on the number of guests you have and how much they love strawberries–these cookies might not last long! Cream together cream cheese, butter and sugar until fluffy and blended. Gradually beat in flour until crumbly dough forms. Form into a ball and transfer to floured work surface. Roll out to about ⅛" thickness. Place about ⅓ teasponn of jam in middle of each square. Pull up two diagonal corners or each square and pinch together in the middle. Tranfer to prepared sheet leaving about an inch in between each. Leave on cookie sheet for 5 minutes before moving to wire rack to cool. Approximately how many cookies does this recipe yield? I just made these cookies and they didn’t have any taste. The dough needs salt and more sugar. 1/4 cup more of sugar, How did you keep your cookies from opening apart? some of mine opened to a flat cookie. I’m going to try to make them again! with more sugar and salt in the dough. I just made them and I got 27 cookies.